Having an organized kitchen is at the top of the list for most of our clients. When we invent on behalf of our customers, we accomplish our primary goal of exceeding your expectations. And, we also have learned that regardless of the brilliance and innovativeness of our designs, our customers need, want and deserve better. That’s why the design of a new kitchen or bath is never truly completed. There are always small and incremental improvements to enhance what already exists. Everyone wants an organized kitchen with places to store equipment, supplies, utensils or just about anything else that lives in your kitchen. For your kitchen to serve as the epicenter of entertaining, it needs to be well organized, functional, beautiful and clutter free. Because a well-designed kitchen is an organized kitchen, we address storage requirements early in the design process. An almost endless array of options are available to store food, cookware, utensils, countertop appliances (blenders, mixers, etc. ), recycling containers and so on. We suggest our clients assess what currently exists in their kitchens and encourage them to inventory their cookware, bakeware, kitchen tools, storage containers, cutlery, knives, utensils, gadgets and countertop appliances and estimate the frequency of use. This is a great time to purge items that they never use too. Space permitting, items that they use infrequently or even as little as once a year (the large roasting pan for Thanksgiving turkey) can be relegated to upper cabinets or to other rooms in the home to open up prime real estate for the utensils and equipment that they use most frequently. Click here for a guide to a clutter-free kitchen, and if you would like to have a kitchen that will allow you to throw the best dinner parties that you could dream of, please give us a call at (303) 300-4400 in Denver or (303) 688-8279 in Castle Rock Colorado or click here to schedule a consultation. A well-designed kitchen is an organized kitchen. You should expect your kitchen designer to present creative options to maximize the look, feel and functionality of your kitchen space. A technique we often use in our showroom is not to settle for the standard offerings from our manufacturer partners. A recent example was a client who had a smaller space. To help maximize the storage capacity for the new kitchen, we recommended counter-depth upper cabinets. For this project, we knew that the client would not be happy with the standard 12- to 15-inch upper depth cabinets. Instead, we specified 24-inch deep upper cabinets and 24-inch lower cabinets paired with a 25-inch countertop. The reason why standard upper cabinets range in depth from 12 to 15 inches is to avoid encroaching on a workspace. 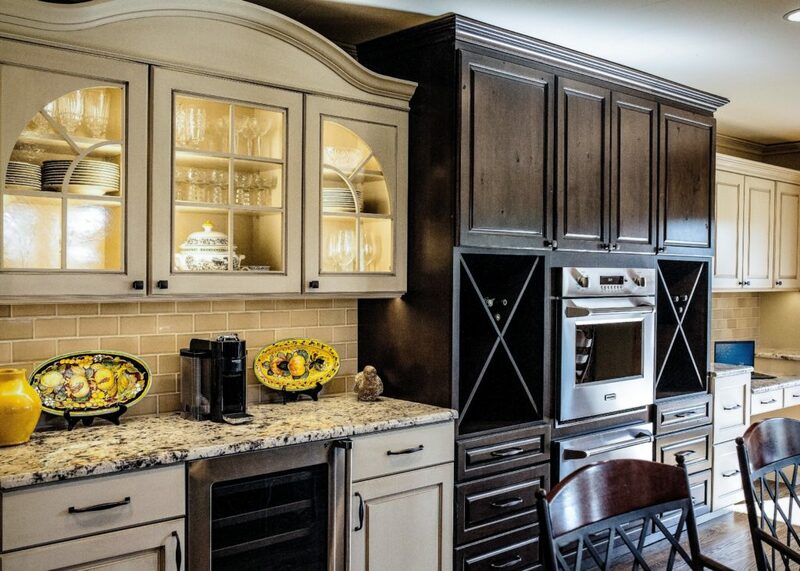 The key to using deeper upper cabinets is to avoid making the space appear to be smaller. 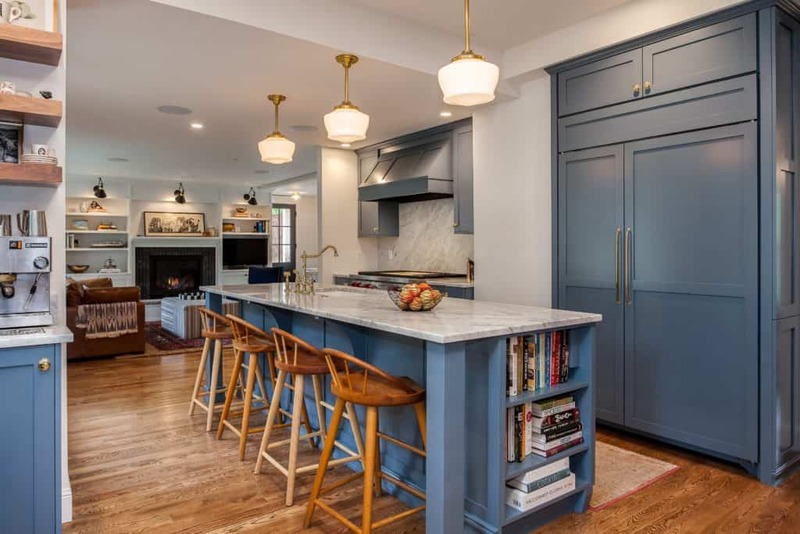 This can be accomplished by the choice of color for upper cabinets, countertops, backsplashes and other surfaces, creative use of lighting and door style. For a modern kitchen motif, we recommend white cabinets and lighter surfaces to provide a more open airy appearance. In one kitchen, we recently determined there was room for an island that we matched with counter-depth upper cabinets. The island served as the main work surface in the kitchen, allowing for a solid wall of cabinets for storage and a clean look. For transitional or traditional motifs, we offset the heaviness of counter-depth upper cabinets by using white and lighter colors for the countertops and backsplashes. Not only does this technique serve to soften the space, it also provides a balanced appearance. Specifying bright under-cabinet lighting creates a focal point and will make the space appear airier. Another technique is to specify glass front doors for upper cabinets or combine upper cabinets with open shelves. Both options balance the heaviness of counter-depth uppers. In some kitchens, it makes sense to use a combination of upper cabinet depths that can be differentiated not only by size but also by using contrasting materials. How much storage space you might need for your kitchen depends upon how you use your kitchen and how often it is used. That’s why we recommend to our clients to make a list of all of the equipment, cutlery, pots, pans, appliances, etc. that they want to store in their kitchen. We help our clients prioritize storage depending on use patterns. For example, if a client does not entertain frequently or are empty nesters, storing large roasting pans may make more sense for another room in the house other than the kitchen to enable the client to have immediate access to the items that they use most often. When you begin thinking about the kitchen of your dreams, one of the best things to do first is inventory everything already in your cabinets, drawers and pantry, on your countertops and elsewhere in the kitchen. It’s a good idea even if you’re not planning to remodel. Consider your cookware, bakeware, kitchen tools, storage containers, cutlery, knives, utensils, gadgets and countertop appliances and estimate frequency of use. Items that you never use should be tossed or donated. Items that you use infrequently or even as little as once a year (the large roasting pan for Thanksgiving turkey) can be relegated to upper cabinets or to other rooms in your home to open up the most accessible places for the utensils and equipment that you use most frequently. Do you have too many glasses in your kitchen? How often to you drink champagne – do you really need to store a dozen or half dozen flutes in the kitchen? Apply the same logic to coffee mugs. How many do you have in your kitchen, and how many do you really need? You can create space by paring down the glassware and mugs that you store in your kitchen to those that you use on a weekly basis. Perhaps you can donate those that you don’t need and then store the others in another room of the house so that you can retrieve them for family affairs, dinner parties and when guests come to visit. You need just one set of silicone potholders, and when it comes to dish towels, seven is the magic number. Getting rid of the dish towels and potholders you don’t need will create new space that can be repurposed. Installing pull out drawers in cabinets is not difficult and can improve the functionality of your kitchen significantly by maximizing space for storage containers and food. It also helps prevent items that are at placed in the back of a drawer from being forgotten. If space is at a premium, consider hanging rails to store commonly used utensils, knives, pots, pans and even potted herbs. Alternatively, determine if your kitchen can accommodate a wall- or ceiling-mounted pot rack. Open shelving can also be a space saver and a venue for pots, pans, small appliances and other kitchen equipment. Create space by using clear plastic containers and large mason jars to store dry goods such as pasta, rice and beans. There are great organizational dividers made for almost any type and size of drawer. Many kitchens’ effectiveness is compromised by having too many items on the countertop. It may make sense to store small appliances such as toasters and coffee makers on the countertop, but if you have a sandwich press or waffle iron another venue most likely is a better option. If you have limited drawer space, consider storing the utensils you use most often, such as spatulas, slotted and wooden spoons, ladles, etc., vertically in a cannister. There are numerous options available to help you better organize and enjoy your kitchen. The following organization tools have caught our attention recently and can be easily installed in any kitchen or bath. Mount organizers or shoe racks to the backsides of interior doors to store and organize cleaning supplies. The back sides of doors offer multiple storage solutions. One customer mounted a chalkboard that is used for grocery lists and installed bars with hooks to hold measuring cups. Install pop-up outlet stations to charge smart devices, laptops, and other electronic devices that enable you to use appliances on islands or other parts of the kitchen where access to power historically is limited. Have too many water bottles and coffee travel mugs? Consider magazine file holders to keep them organized and within hands reach. Need more space for pots and pans? Check out a sliding rack mounted underneath your kitchen sink. Snacks such as pretzels and chips in family-sized packages create storage challenges. Try attaching snack packages to skirt hangers and placing them in a pantry or in a cabinet. Convert your fake drawer into a paper towel holder. We recently placed a cutting board with a hole in the center of it inside the top drawer of a cabinet. Below is the trash container that accepts scraps. Have lots of knives, forks, spoons and other utensils? Check out tiered drawer organizers. Cake stands can be used for more than displaying your favorite dessert. One of our customers is using a sculptural cake stand as an elevated soap dish. Need a dedicated place for charging cell phones? Attach a towel rack with a hanging basket below an electrical outlet. Expand your storage and workspaces with a kitchen cart on wheels. Store trash bags on rollers underneath the sink or in a cabinet. 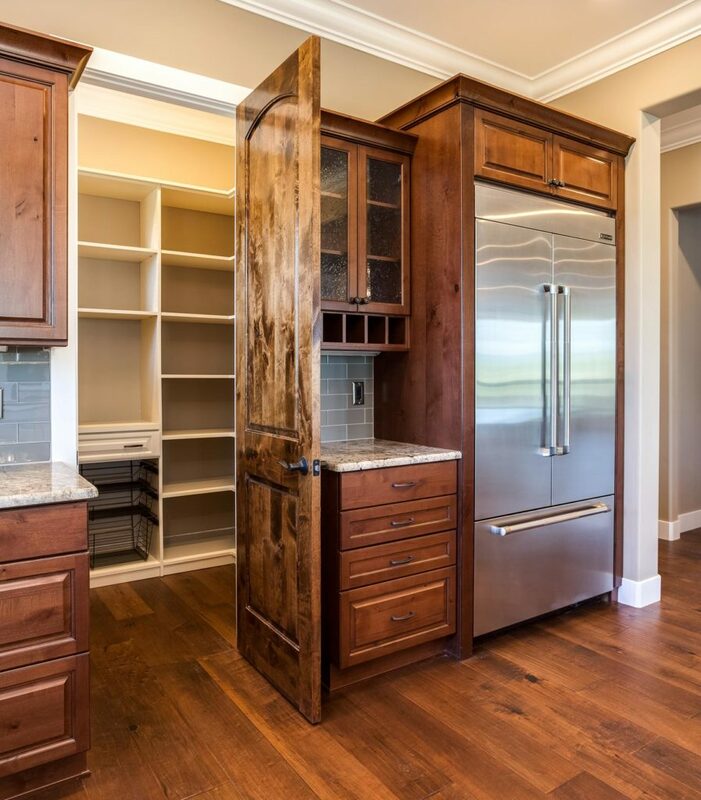 Not only are these kitchen cabinets beautiful but they are also functional inside. Take a look at just a sampling of the different storage and organizational features your JM designer can add to your custom kitchen. These extras make your life easier whether you are cooking dinner for the family or entertaining a huge crowd. 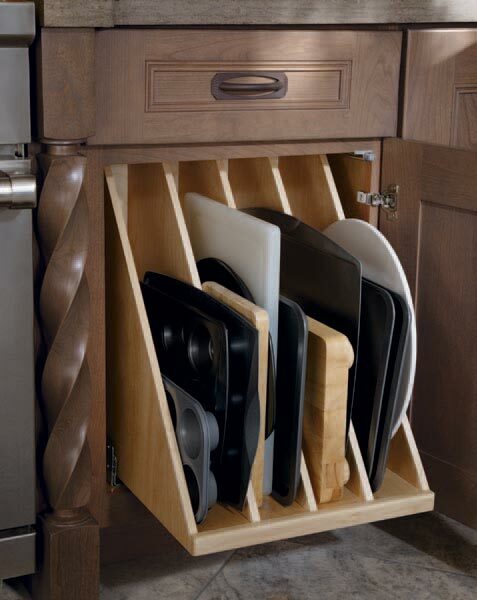 Each line of cabinetry that JM uses to design kitchens has its own special organization and storage special features. If you are interested in learning how to make your kitchen more attractive and easier to use with innovative storage ideas, give us a call (303) 300-4400 in Denver or (303) 688-8279 in Castle Rock Colorado or click here to schedule a consultation.